An increasing number of young patients are undergoing hip arthroplasty for a variety of causes. The mode of delivery and management of such patients remains a challenge and has to be individualized. 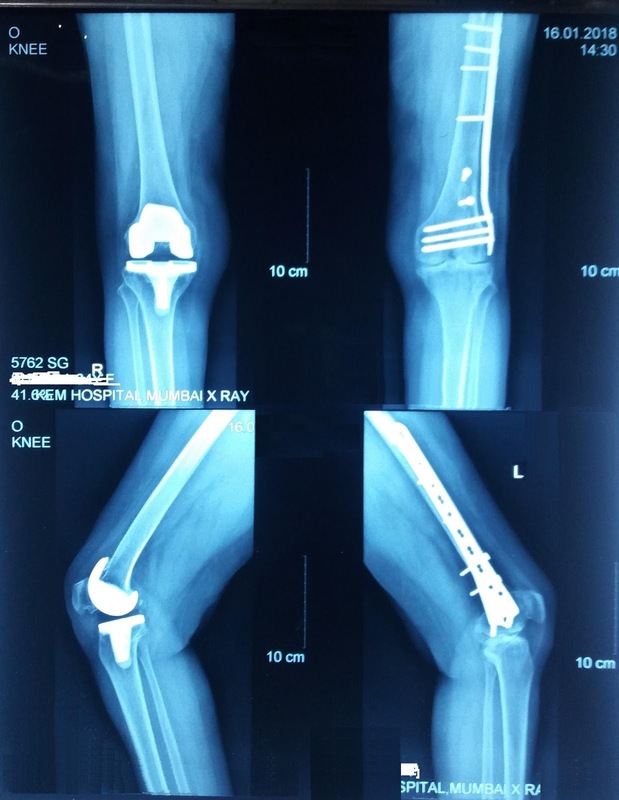 This case report discusses the mode of delivery in a multigravida patient with history of unilateral total hip arthroplasty and contralateral knee arthroplasty. Total hip and knee arthroplasty is one of the most successful orthopedic procedures performed today with minimal postoperative complications and restores maximum range of motion in a diseased joint. Pregnant women with total hip and/ or knee arthroplasty who do not have any obstetric indication for cesarean section should be given a vaginal trial depending upon the range of motion at the hip as well as the knee joint, feasibility for lithotomy position, condition of the prosthesis and severity of the symptoms. This will decrease the morbidity related to cesarean section. 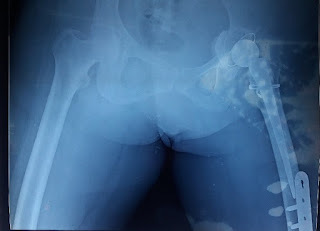 A 34 year old gravida 2, para 1, living 1, was referred for antenatal registration to our hospital at 39 weeks of gestation in view of previous history of hip and knee joint replacement. She was registered in a private hospital at 9 weeks of gestation and had regular antenatal visits during which she received calcium, iron and folic acid supplements. She had undergone right knee arthroplasty 3 years back in view of osteoarthritis. Left hip arthroplasty and left distal femur open reduction and internal fixation were also done 2 and a half years back for osteoarthritis. She did not have any difficulty while walking, but had difficult while climbing stairs and needed help for the same. Her gait did not fit into any specific described abnormal gait in literature. Since there was some difficulty anticipated during vaginal delivery, an orthopedic consultation was sought. As she was able to perform flexion and extension movements at the repaired hip and knee joint, orthopedic consultant opined that vaginal delivery was not contraindicated, but special caution should be exercised to avoid hyperflexion at the hip joint. Hence it was decided to give vaginal trial and consider cesarean section only for an obstetric indication. She came to the emergency one week later in spontaneous labor. General examination was within normal limits. Cardio-respiratory systems were within normal limits. On abdominal examination uterus was full term with a vertex presentation that was 3/5th palpable. Fetal heart sounds were regular with a rate of 140 beats per minute. She was having two uterine contractions each lasting for twenty seconds in a 10-minute period. On vaginal examination the cervix was 2 centimeter dilated and 40 % effaced, vertex was at station minus 2, and membranes were present. She progressed spontaneously. During second stage of labor she was given a position in which both her legs were flexed to approximately 70 degrees at the hip joint and knees were flexed to 30 degrees with padded stirrups to support. A small perineal tear was noticed which was sutured with chromic catgut no.’0’in the same position which was used for delivery. She delivered a healthy baby weighing 2.5 kilograms with Apgar of 9/10 A post-delivery radiograph for bilateral hip and knee was done, no dislocation or dislodgement of the prosthesis was identified (figures 1, 2, 3). Figure 1. Radiograph showing total left hip arthroplasty (acetabular and femoral implant) in situ before delivery. Figure 2. Radiograph showing total left hip arthroplasty (acetabular and femoral implant) in situ after delivery and no dislocation identified. Figure 3. Radiograph showing antero-posterior and lateral view of right knee joint prosthesis in situ and no dislocation identified. The pelvis is an articulation of the two symmetrical hip bones (innominate bones) and sacrum. It consists of three joints the sacroiliac joint, pubic symphysis and hip joint. The hip joint is an articulation of the acetabulum (the part over the pelvic bone) and the head of the femur. The hip joint which has a wide range of movements, is susceptible to restrictions due to a number of causes, a common etiology being osteoarthritis. Women in the reproductive age group can develop end stage arthritis of the hip due to developmental hip dysplasia, osteonecrosis, juvenile inflammatory arthritis and trauma. Some of them may require total hip arthroplasty. It is imperative that any problems affecting the hip joint would affect the pelvis. Our patient underwent the arthroplasty due to osteoarthritis of the hip and knee. The prevalence of hip and knee osteoarthritis worldwide is approximately 7.4 % and 12.2 % respectively. The incidence is slightly more in women than in men (6.7 %). 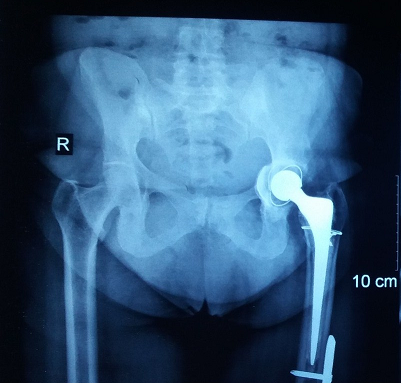 About 2.2 % of patients who undergo total hip arthroplasty are women of reproductive age group and 14 % of them need hip arthroplasty in view of inflammatory rheumatic disease. Although osteoarthritis is a degenerative disorder, a rising trend in younger age group is noted due to increased incidence of obesity, lower bone mineral density and vascular diseases. Multiparity also has been associated with increased risk of symptomatic osteoarthritis especially of the knee joint. From a biomechanical point of view, neither hip nor knee joint replacement is a contraindication for pregnancy or for vaginal delivery. Pregnancy and delivery does not have any negative effects on the joints in terms of risk of dislocation, loosening, fracture, or revision surgery. The mode of delivery in patients with history of arthroplasty has to be individualized depending upon the obstetric risk factors. Arthroplasty of the hip and/ or knee joint is not an absolute indication for cesarean section. These patients can be given a vaginal trial as long as the patient can adopt a lithotomy position. Lithotomy position is the most commonly employed position for childbirth and instrumental delivery. There are three subtypes of lithotomy position; high lithotomy, standard lithotomy and low lithotomy. In a standard lithotomy position the patients’ legs are separated from the midline into 30 to 45 degrees of abduction and the hips are flexed until the thighs are angled between 80 and 100 degrees. Knee flexion required is 70 to 90 degrees. Patient's legs are placed into stirrups, with the knees bent and the lower legs are parallel to the plane of the torso. In high lithotomy position angulations at hip and knee joints are more acute whereas more obtuse in low lithotomy position. In our case the range of motion at knee and hip joints after arthroplasty remained unaffected. Hence during delivery low lithotomy position could be given. In total hip arthroplasty, the diseased articular surfaces are replaced with synthetic materials (like metal implants), thus relieving pain and improving joint kinematics and function. Metal implants used for arthroplasty corrode and release metal ions such as cobalt and chromium, which may cause systemic toxicity. However there was no study addressing the issue of adequate time interval between joint replacement surgery and pregnancy. Nepruez et al have opined that a minimum of 1 year duration is required for regaining maximum range of movements post arthroplasty. Hence pregnancy is better avoided till maximum joint function is regained so as to avoid the additional stress of pregnancy. In our case, the patient conceived after two years of the arthroplasty. She did not have any significant orthopedic problems in the antenatal period. Normal vaginal delivery can be conducted in patients with hip and/ or knee arthroplasty. These joints replacements do not classify as an indication for cesarean section. Also the functionality of the joint and longevity of the prosthesis is not affected by vaginal delivery. Quintana JM, Arostegui I, Escobar A, Azkarate J, Goenaga JI, Lafuente I. Prevalence of knee and hip osteoarthritis and the appropriateness of joint replacement in an older population. Arch Intern Med . 2008;168(14):1576-84. Ostensen M. [Hip prostheses in women of fertile age. Consequences for sexuality and reproduction]. Journal of the Norwegian Medical Association: 1993; 113(12):1483–5. Litwic A, Edwards MH, Dennison EM, Cooper C. Epidemiology and burden of osteoarthritis. Br Med Bull. 2013;105:185–99. Wise BL, Niu J, Zhang Y, Felson DT, Bradley LA, Segal N, et al. The association of parity with osteoarthritis and knee replacement in the multicenter osteoarthritis study. Osteoarthritis Cartilage. 2013;21(12):1849–54. Sierra RJ, Trousdale RT, Cabanela ME. Pregnancy and childbirth after total hip arthroplasty. J Bone Joint Surg Br 2005 ;87(1):21–4. Maffulli N, Del Buono A, Denaro V. Hip artroplasty: A transient reason not to be pregnant. Surgeon. 2012;10(6): 347–9. Neuprez A, Neuprez AH, Kaux J-F, Kurth W, Daniel C, Thirion T, et al. Early Clinically Relevant Improvement in Quality of Life and Clinical Outcomes 1 Year Postsurgery in Patients with Knee and Hip Joint Arthroplasties. Cartilage.2017;00(0):1-13. McDowell CM, Lachiewicz PF. Pregnancy after total hip arthroplasty. J Bone Joint Surg Am. 2001;83–A(10):1490–4.